Have you downloaded your free copy of the Fall issue of Rusty Tin Roof online magazine? If you prefer to read it ONLINE, you now have that option as well! Lots of great free pattern downloads and craft articles. Read here. We had a wonderful time! The weather was so nice the entire trip. We walked the boardwalk daily, and the beach twice. Our first night we had dinner at PF Changs and I did play the slots for all of 8 minutes and lost $80. That was enough for me. Not a gambler. I'd rather have something to show for my money. We went out and walked the boardwalk and did some shopping. I bought 2 purses for $20 each. The black one is for me and the other for a Christmas gift. I also bought myself 2 stretch bracelets. I have a large wrist so these suit me to a T.
Our 2nd day, Tuesday, we had brunch around the corner from the Tropicana at a place called The Baltimore House. Their pizza is delicious! We LOVE all that gooey mozzarella! Sauce was very good and toppings fresh and delicious. They make their own crust. That evening we saw the show MAGIQUE, Grand Illusionists Kevin & Caruso. Excellent show! We had a late dinner at Hooters. We went to the IMAX theatre ( Tropicana) that afternoon to see MORTAL INSTRUMENTS - CITY OF BONES. We both really liked the movie. We enjoyed the pizza from the day before so much we went back for dinner. Good thing we were walking the boardwalk.....but I doubt we burned up all those calories!! 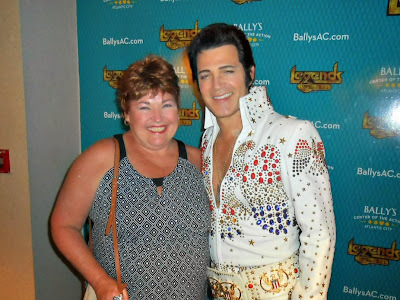 That evening we went to Tropicana COMEDY CLUB. Another good show with comedians Lucas Bohn, Karen Rontowski & Jim David. Our last day in Atlantic City, Thursday. We went next door to the COUNTRY KITCHEN for breakfast and back again for a roast turkey dinner. 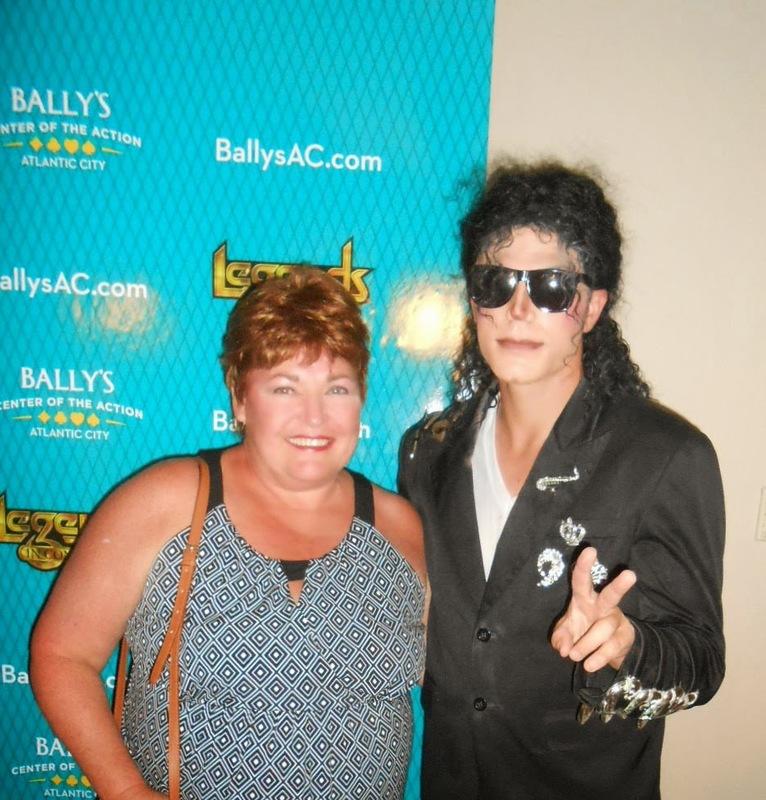 That evening we went to see LEGENDS at Ballys starring Elvis, Michael Jackson, Liza Minnelli & Justin Timberlake. We left AC Friday morning and drove to Lancaster, PA for the day. We got there at 10:30 am and shopped all day and had dinner at Dienners Restaurant. All three of our daughters would make a 10 hour round trip in one day just to eat there! I went to the wholesale shop Amish Trader Co. and bought some homespun to replenish my stock. In one of the gift shops I found 9 really cute wooden candy corn bowl fillers. Tom drilled holes in them for me today so I can hang them on my seasonal tree. We decided to drive on to Harrisburg and spend the night at Howard Johnsons. There is a micro brewery / restaurant next door called LANCASTER BREWING COMPANY. We stopped in for a couple beers before going to bed. I had the Lancaster Lager and Tom had a Shoofly Porter and Baked Pumpkin Ale. A must try!! that sounds like a fabulous vacation. I love those bracelets you bought, especially the one on the left. Sounds like I need to tag along with you two on the next trip, what fun!